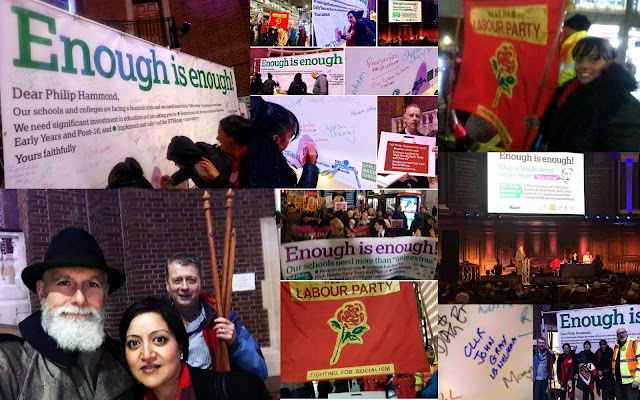 Picture collage from yesterday's evening demo and rally in Westminster against cuts in school funding. Despite the rain, it was a cheerful, noisy and well attended event. Newham Labour Group met up with local activists beforehand at Stratford Station (second time within 4 days) led by our Mayor, Rokhsana Fiaz and cabinet member for Schools, Cllr Julianne Marriott, to travel to the demo together. We all arrived at the rally somewhat wet and bedraggled but signed the "Enough is enough" petition on cuts to school funding to send to Chancellor, Philip Hammond. I had to leave rally before main speakers, Angela Rayner MP and our Leader, Jeremy Corbyn MP to attend my local Newham Citizen Assembly in Stratford. (Hat tip pictures stolen from various Party members & activists twitter & Facebook accounts).